Here are the world’s first photos of the Honda Hornet 900, the Hornet with a FireBlade engine. Honda is due to officially reveal the Fazer 1000 rival in September. At a glance, the new machine looks anything but radical – in fact, you would be hard-pressed to tell it from its 600cc sibling, which has gone unchanged since its 1997 launch. However, a closer look reveals give-aways like the twin exhaust pipes where the 600 makes do with one, while sitting the bikes side-by-side demonstrates how much bigger the new Hornet’s engine is compared to the 600’s CBR600-based motor. Those cans might be a styling gimmick, but their position means the Hornet 900 plenty of ground clearance. That’s pretty handy, as corners are just what this bike has been built for. Insiders in Japan say the new Hornet 900 is aimed to be fun above anything else – and it looks like they’ve got it right on target. The bike’s expected to have incredibly quick steering, while the engine has been tuned to give instant throttle response and loads of grunt. Wheelies won’t just be possible, they’ll be mandatory. And there’s another ace hidden up the Hornet’s sleeve – the price. Although Honda UK would not provide any information about the bike, MCN’s Japanese insiders say the Hornet should cost less than £6000 when it goes on sale next year. The 143bhp R1-powered Fazer 1000 is listed at £7799. But the Hornet’s engine is derived from the old, pre-2000 FireBlade rather than the latest model. That means its capacity is likely to be 918cc rather than the 929cc of today’s Blade – but you won’t be short changed on power. The motor is fitted with fuel injection to comply with the latest European emissions laws. It could make around 130bhp at the back wheel. The Honda will tip the scales at around 195kg (429lb) – far less than the Fazer, which weighs 208kg (457lb). So power-to-weight ratios will be close. 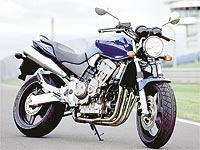 A Honda insider said: " The bike is fun and quick steering – so it can manoeuvre easily in cities. It isn’t intended to be practical, instead it’s got a brash, fun look and loads of grunt – it’s going for the rawness of the original FireBlade. " To get sharp steering, Honda has opted for a very short wheelbase and steep head angle. However, the frame itself sticks to the tried and tested formula of the original Hornet 600. That means it’s a steel backbone design, bolted to aluminium brackets, which hold the engine and swingarm. The swingarm itself is a new, extruded aluminium design rather than the box-section steel unit used on the Hornet 600 – saving weight and increasing the strength. It is bolted to a single monoshock, which is expected to get pre-load adjustment but little else. The right-way-up forks are also unlikely to have much adjustment – but for the bike’s price, you wouldn’t expect more. Where Honda hasn’t skimped is on the brakes – always a weak point on the original Hornet. On the 900, they’re the same calipers as used on the Blade and the SP-1. More on this story in MCN, published Wednesday, August 1, 2001.